Inspired by Michael Jordan’s continued flight status and a WWII fighter plane the Men’s Air Jordan Retro V Basketball Shoe is another custom Tinker Hatfield tinkered to perfection. With another scoring title under his belt and a 69 point outbreak against the Cavaliers, Jordan needed a shoe that would live up to his elevated game. 1990 proved to be a good year, Michael’s aerial attack inspired the WWII Spitfire flames on the V’s. 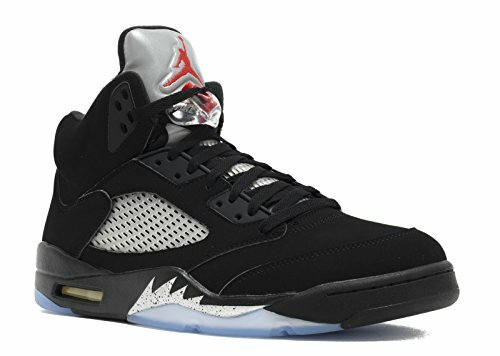 This shoe introduced a padded tongue displaying a continuance of the iconic jumpman logo, and a first for clear rubber outsoles. Additionally, a plastic lace-lock, suede upper and side vents converge to form a fighter like shoe ready for takeoff.